My mom sent me a link to this article: Don’t Just ‘Lean In’: 10 Ways Women Entrepreneurs and Leaders Should Take Action Now. Which discusses a new social network, called Lean In, to support entrepreneurial women and then provides 10 tips. Stop talking about being a victim—words become beliefs that become reality. Be a positive voice in the gender conversation, and look for the gratitude and lessons in every situation. Smile and say “thank you” when complimented. Practice having honest and open dialogue—start with family or close friends and then move outwards. Be mindful of appropriateness, but eventually this kind of authentic vulnerability and boundary setting will feel seamless, natural, and empowering. Don’t wait for an invitation—ask for what you want. Nobody can read your mind, and life becomes much more fun when it’s interactive. Stop discrediting your achievements, and do not apologize your way out of the discomfort you feel as a result of your growth. Own it. If you’ve been talking about wanting to do something for a while, seek support and GO DO IT. Your taking action gives others permission to do the same. Set realistic expectations for yourself, and let go of the desire to be perfect. Watch as your frustrations with other people’s imperfections ease. If you feel competitive with another woman, reach out and offer to help her out. It’s amazing what counter-action (and a little kindness) can do to dissolve negative feelings. Do this for yourself—resentment is toxic only to the one harboring it. Stop obsessing and talking about your guilt. This self-centeredness stalls needed progress. Instead, use your emotions as a guidepost, allowing you to course-correct at anytime. Raise your hand, and keep it up. Frankly, I was put off by the assumptions that guide the 10 tips. Like “stop being a victim” and “stop feeling guilty.” I’m sure that: a) those aren’t the things that hold me back, and b) if they were, the author provides no guidance as to how to go about doing these things which wouldn’t help anybody feel better if they’re already feeling victimized (targeted) and guilty! Oh, AND, this article makes no mention of the larger, systemic issues like patriarchy or how capitalism has been set up to privilege (white) men and undervalue women. I’m not going to go in to that ball of wax here, but is central and should not be left out of this discussion. 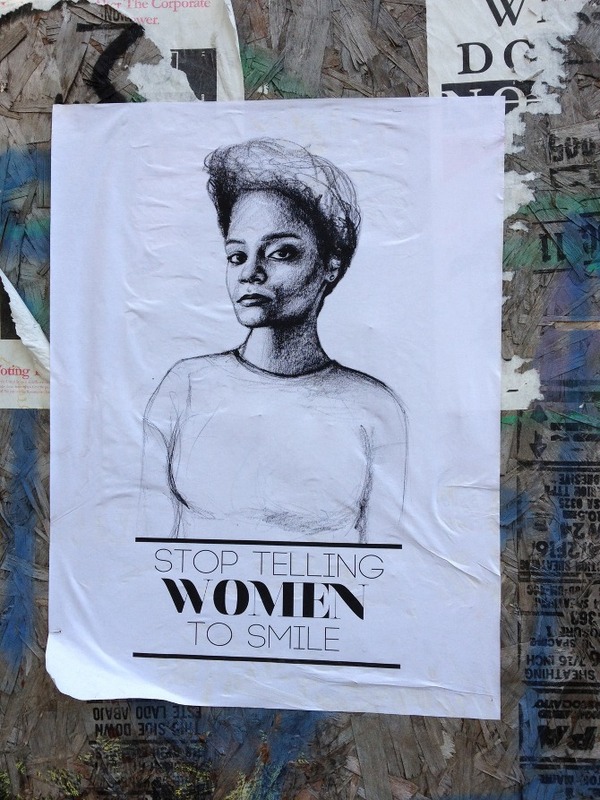 The suggestions also remind me of a recent artist’s work against street harassment, called Stop Telling Women to Smile. Oversimplified, cliche pop-psychology advice from a blog post isn’t going to change anything for female entrepreneurs. On the other hand, the narrative part of the article that suggests building a support group of like-minded women (and maybe a few men), then addressing/discussing these items as a group, and sharing what actually works IS helpful. Those bullets makes me feel like the author is stereotyping me, saying to stop doing something, and providing no path as to how to do so, completely devoid of the larger socio-cultural context. I’m tired of that. Stop stereotyping women and provide meaningful, personal support before you make suggestions as to how we should live our lives, think about ourselves, and run our businesses.